I’ve been sick for about a week. So that meant a lot of tea (I don’t even drink tea), Hot Toddies (I don’t even like them), gargling salt water, cough drops and Nyquill. There’s been a fair amount of lemon and honey in my diet, which I don’t mind – well, aside from why there was so much lemon and honey in my diet. After I finally started feeling better, I craved honey. And since it’s probably not acceptable to just drink honey straight out of the bottle, I decided to come up with a delicious alternative. I had a box of off-brand Honeycombs cereal in the pantry, so I grabbed a handful of those to munch on while I contemplated what I was going to make. And then I decided I would make a honey latte (which is totally not that difficult, by the way) using a Starbucks Vanilla K-Cup to wash down the Honeycombs. So as I sat on my kitchen floor (I don’t know why – I have a perfectly good dining room table with four chairs to choose from) it occurred to me that the combination of honey and vanilla is delicious. And would probably be awesome in frosting. So I used a tried and true white cupcake recipe and made a few tweaks to incorporate the right balance of honey and vanilla. And then I used the frosting recipe from my Dashing Through the Snow cupcakes as a base for this honey and vanilla buttercream (without the peppermint, obviously) and it turned out exactly how I wanted. I decided to do mini cupcakes because when I’m trying a new recipe, I like to have bite sized samples to give to friends and coworkers to get their opinions for troubleshooting purposes. Quality Assurance is part of my day job, and clearly I don’t leave it at the door. They’re light and not too sweet. They don’t smell like vanilla or honey – which is bizarre to me, by the way – but the taste is the perfect balance of both. I hope you like these as much as I do! 1) Preheat oven to 350° F. Line a mini muffin pan with liners, or spray with non-stick spray and set aside. 2) In a large bowl, cream together butter and sugar until well combined. 3) In a medium bowl, mix together buttermilk, honey and vanilla. Set aside. 4) In a separate medium bowl, mix together flour, baking powder and salt. Set aside. 5) Add eggs to large bowl with butter mixture and beat well. 6) Add half of the dry ingredient mixture and mix well, then add half of the wet mixture and mix well. Repeat for the remaining mixtures. 7) Fill each cup of prepared pan 3/4 full and bake for 15-18 minutes. A toothpick inserted into the center of one of the mini cupcakes should come out clean. 8) Let cupcakes cool in pan for 5-10 minutes, then move to cooling rack to cool completely. While cupcakes are cooling, prepare the frosting! 9) In a large bowl, cream together butter and cream cheese until well combined. It’s easiest to slice the butter and cream cheese into small cubes to make this process go more quickly and smoothly. 10) Add powdered sugar, 1 cup at a time, mixing well in between each addition. 11) Add honey and vanilla. Mix until well combined. 12) Frost cupcakes as desired (I used a piping bag with a decorative tip for mine), add sprinkles and top with a piece of Honeycomb cereal. Enjoy! *Should you need to make your own buttermilk, just fill a measuring cup with 1/2 cup of regular milk and add a teaspoon of either white vinegar or lemon juice. Let it sit out for about 10-15 minutes and you’ll notice it start to curdle. Stir it a couple times, and then add it in when needed. I never, ever buy buttermilk because I don’t use it often enough to justify the purchase, so I do this all the time. These are really good! 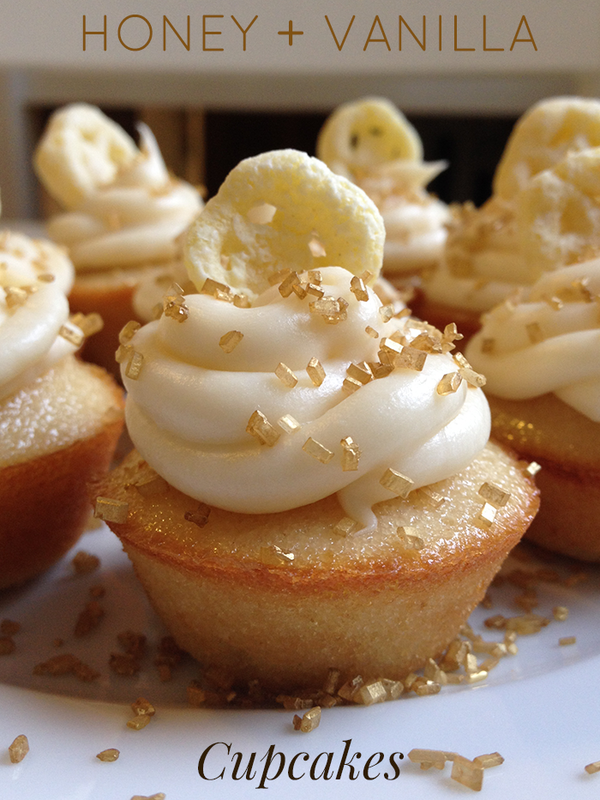 I’ve never been able to make presentable cupcakes until I tried this recipe. So excited I finally have a cupcake recipe I can depend on 🙂 thank you for sharing! !